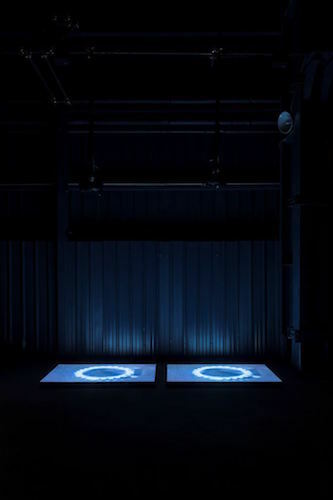 Mirosław Bałka, BlueGasEyes, 2004, HD video, color, sound, 3 minutes 37 seconds, two screens, steel, salt, 4 x 50 x 67". Installation view. Eighteen works emerge from the dark in this huge industrial hall. The exhibition starts and ends with Holding the Horizon, 2016, which is installed above the entrance and shows a simple yellow horizontal shape that nervously moves up and down on a LED screen. Continuing through the exhibition, it becomes clear that this horizon introduces scale, balance, and orientation, just as it questions and disturbs all of this. It is an image making an effort to hold itself up. Wege zur Behandlung von Schmerzen (Ways to Treat Pain), 2011, is emblematic of Mirosław Bałka’s attitude. This sculpture confronts us with something unpleasant, hidden, or impossible and, at the same time, transforms the encounter into a poetic or healing experience. Dirty water pours down from the ceiling through a tube high above, which can be seen only from a distance, as the huge size of the metal container where the water collects prevents the viewer from taking a closer look. Yet a spotlight directed onto the streaming water alters the contaminated liquid, making it appear lucid and clean. BlueGasEyes, 2004, shows two ranges of gas flames projected onto rectangles of salt on the floor. The sound of the fires, plus their restless movement, has a disquieting effect, while the work’s title makes it hard not to think about the Holocaust. Though we are, in fact, just looking at a domestic kitchen scene––the blaze feels like two beautiful flowers of evil.